O’FALLON – Train enthusiasts and drivers were left wondering when the tracks running through town were going to be used during the first half of the weekend, as the planned CSX rail car movement from Shattuc and Aviston westward took a bit longer than originally planned. Approximately 210 cars were stored east of O’Fallon on the closed rail line. Late last year, the company was approved by the Federal Railroad Administration to move those cars west and store them elsewhere. Since the crossbars had been removed from all of the crossings, CSX had to work within fixed hours of the day and not exceed ten miles per hour. Additionally, CSX staff and police had to be at every crossing to ensure safety. 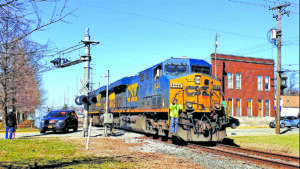 Due to these restrictions, CSX moved the engine needed to pull the cars east on Wednesday, March 13. They planned to move cars from Shattuc to Aviston on Thursday, March 14, and then make the return trip west to Rose Lake on Friday, March 15. According to local train expert Steven Gilroy, there were questions about how well the plan would work from the start. “If you recall last time, the train stalled in Caseyville as they were moving the cars out to Shattuc, and they had to get helper engines to push from behind. Unfortunately, the lesson was not learnt from this, and what should’ve been a simple operation unfolded quite differently. Rather than taking three engines like we railfans all anticipated, around noon on Wednesday they came into Caseyville with merely one single engine, CSXT 8817, an EMD SD40-2 (3000 HP), which is a reliable engine, but older, less powerful, and usually used for local operations and yard work. Certainly insufficient for the task at hand,” Gilroy said. CSX moved the engine through O’Fallon on Wednesday and then tied it down near Carlyle for the night. Then on Thursday morning they took it to Shattuc, brake-tested the cars, and then pulled them up to Aviston. But upon arriving at Aviston and hooking up the cars, Gilroy said CSX had the realization that one engine would not be sufficient, so they tied the train down just outside of Trenton for the night, planning to send additional power in on Friday morning. On Friday morning, Gilroy explained that CSX changed their mind and decided they would attempt the entire move with just the one engine. “The train stalled multiple times, but they finally managed to get it going, creeping along sometimes at five miles per hour, sometimes at only one mile per hour. It stalled again near Trenton and they decided to give up on that plan. Just imagine if they had tried to come through O’Fallon with a three to four mile long train at one mile per hour,” Gilroy said. CSX left Aviston early Friday afternoon. However, they ended up shoving the train back to Aviston and leaving around 50 cars on the track, before trying to proceed west with the remaining cars. The train was doing fine across the farm fields until reaching Lebanon and trying to climb the hill from Silver Creek into O’Fallon. “The train, even with the reduced length, stalled on the hill, and with failing sunlight and the crew short on hours with their shift ending at 6 p.m., there was insufficient time for them to move another engine out and then bring it all back to Rose Lake. If they had run out of hours before reaching the yard, they would have had to have stopped wherever they were, even if it cut off a road. So they decided to leave those cars on the track between O’Fallon and Lebanon and brought the engine into town around 5 p.m. where it was left for the night right by Smiley,” Gilroy explained. Saturday morning CSX brought in two road engines that Gilroy described as “the big guns” that were sent eastbound through town, attached to the engine already here, and headed east to Lebanon to get the cars. At around noon on Saturday, with a combined 11,400 horsepower, the train finally rolled through O’Fallon. Gilroy said there are still some loose ends to be cleaned up. “The cars in Shattuc have been cleared, but the cars in Aviston remain, albeit no longer in town but instead sitting outside of town to the west. CSX will run another train sometime in the next two weeks to retrieve those remaining cars, including another eastbound power move beforehand. It must be completed by the middle of April, which is when the FRA operational waiver expires,” Gilroy explained. Gilroy did say it was important to note that while this operation didn’t go as planned, the delays were not the fault of the crews. “Everyone did their best with what they were given to work with by management. Also, I’ve heard the crews who were qualified for this line are no longer around, so it’s possible the current employees in the operations department weren’t aware of how hilly the line actually is on the west end, which affects the power calculations,” Gilroy said. Gilroy said the big remaining question is what will happen with the line. “The questioning remaining of course is, then what? Well, after this, the rail will most likely be removed again in Caseyville, and the line will go dormant again for the indefinite future. As of now, CSX has no plans of either reopening the line, nor of abandoning it. So at the present time there is no intention of converting it to a trail or of it being reactivated for use by CSX. While either of those may transpire in the future, with the latter extremely unlikely and the former subject to many politics, the immediate future is that it will sit there dormant, slowly decaying and being overgrown while being maintained to minimum safety standards, including all of the crossing signals being maintained. The other option is that they will try to sell the line, since there are multiple interested parties and CSX has stated they have no plans to reopen it themselves. Only time will tell,” Gilroy said.